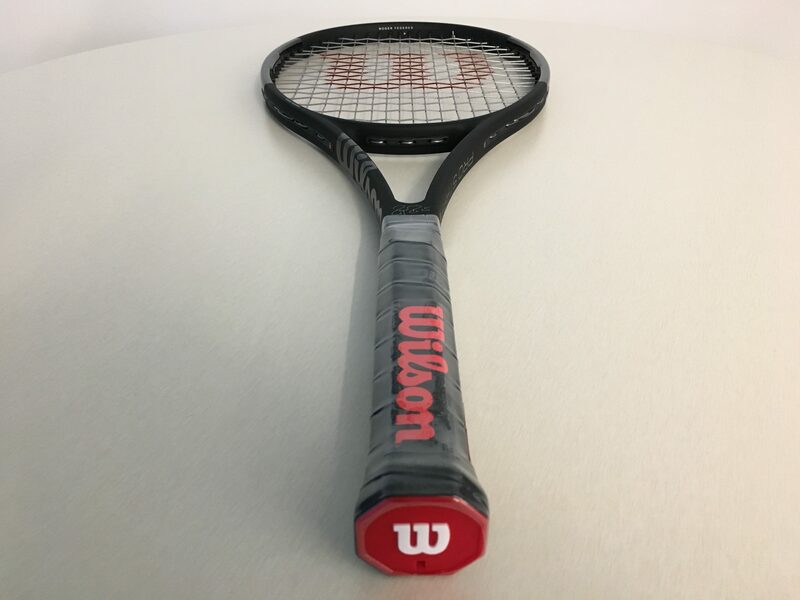 Wilson Pro Staff RF97 Autograph 100 Hours Review – Yes, Mr. Federer, it does come in black. The all black, Wilson Pro Staff RF97 Autograph. The new racket is as sleek as it is stunning. Co-designed by Roger Federer himself in alliance with Wilson, this frame is one for history. After play-testing with the new version of the Pro Staff RF97 Autograph for over 100 hours, it is a pleasure to share this review. It’s been about three years since the debut of the first Pro Staff RF97, which featured a gorgeous red and black design. Hidden under a blacked out, prototype frame, Federer had been playing with the unreleased racket in a brief stint in the summer of 2013, and then in the off season that year. He played with the blacked out prototype in 2014 until the formal release of the previously mentioned red/black model. Secretly, we all wished for that all-black racket, and Wilson delivered with the new design. In a combination of matte finish with tuxedo glossy black, the new Pro Staff RF97 Autograph is every bit the racket which came out in 2014. The frame is still 97 square inches. Back in 2014, it amazed me at how a racket with a much larger head size than the previous 90″ and even 85″ models could still provide a similar level of feel. This racket carries the fundamental characteristics in weight and balance of a Pro Staff. 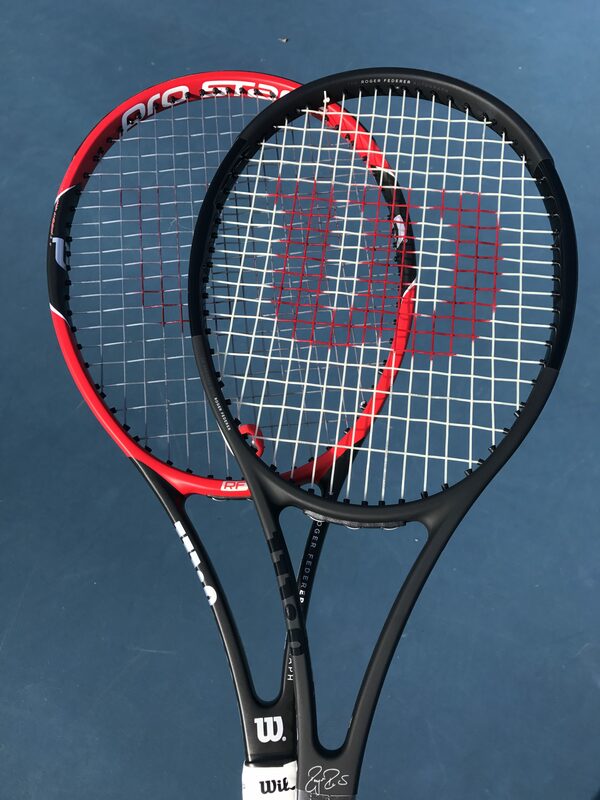 Identical to its predecessor, the 2014 Wilson Pro Staff RF97 Autograph, in red and black, the new, all-black model weighs about 12.6 ounces strung, with 16 x 19 string pattern, 9 points headlight strung balance and 335 swingweight. Retaining a 21.5mm beam, the racket composition is braided graphite with kevlar, and is meant for players with full, fast strokes. In my time playing with this new racket, as with the original RF97, I was impressed when starting out, hitting groundstrokes. The perfect balance of crisp contact with the larger sweet spot, easy power, control and plow through was rewarding and satisfying. Coming from someone who grew up playing with a Pro Staff 85 and Pro Staff 90 models for over a decade, the Pro Staff RF97 Autograph is the easiest racket yet to maneuver for any stroke on the court. It is very finely balanced all around for a 97 square inch frame. Volleys are a part of my game that I have embraced more and more in recent years, and the new RF97 model helps bring rock solid stability with responsive feel when making contact out in front. I used to struggle at times handling fast paced shots at net with Pro Staff 90 models if I was not fully prepared at the net, but with the RF97, the weight might still be the same, however it feels significantly lighter and is easier to be ready for the next groundstroke headed your way. On serves, this has been the stroke where I’ve found the biggest change in finding easy power, and the most forgiveness on, especially for hitting kick serves. It was challenging to generate a lot of spin on second serves over the years with the Pro Staff 90 models, but the new RF97 enables that option. With the added confidence knowing this new RF97 racket can boost your serve for power and weight on the ball, it really helps set up a one-two combination, letting you think one stroke ahead in points. Almost as much of an impact to my game as on serves, were returns, especially on the backhand side. Having the larger 97 square inch head size, the easier, more maneuverable 12.6 ounce weight, I wouldn’t hesitate to only slice backhand returns, or only block forehand returns off fast serves. As with the original RF97, I was able to hit over the ball on both groundstrokes with the all-black RF97, and seeing the difference was immediately notable in the depth of my returns. After giving the Wilson Pro Staff RF97 Autograph 100 Hours Review the time it deserves in playing with the new, all-black RF97 model, this racket is amazing. Why change a good thing? The original red/black model was engineered precisely, and I am glad Wilson kept that aspect of the racket the same. Adding the all-black finish with perfect blend of matte black and tuxedo glossy black makes for a phenomenal look. 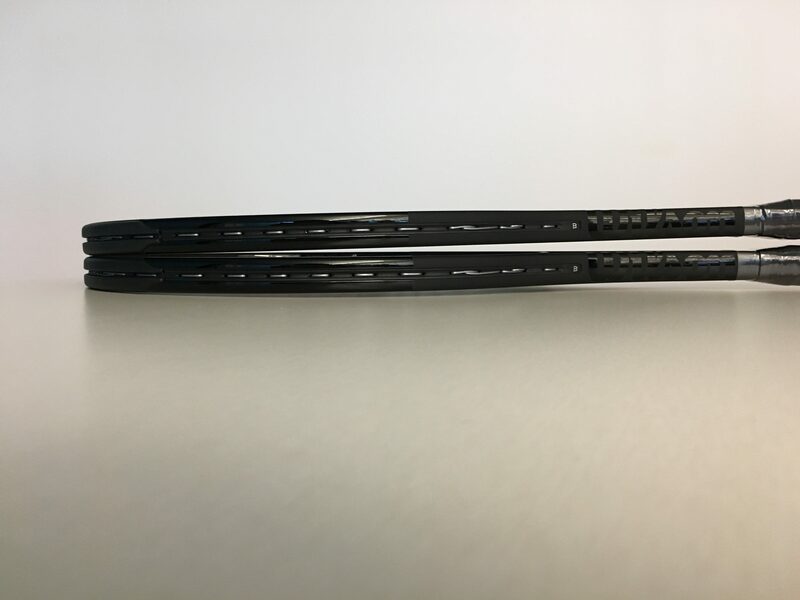 The Wilson Pro Staff RF97 Autograph is one of the finest crafted player’s rackets the company has ever made, and as with the original RF97, this new, all-black model, paying homage to the black colorways of the original Pro Staff frames, is an instant classic. Read the official Wilson Pro Staff RF97 Autograph press release here. Chicago-based Wilson Sporting Goods Co., a subsidiary of Amer Sports, is one of the world’s leading manufacturer of high performance sports equipment, apparel and accessories. Wilson is the global leader in performance tennis and uses player insights to develop products that push tennis equipment innovation into new territories. Through its dedication to creating products that enable athletes at every level to perform at their best, Wilson has earned its place as a leader in sporting goods for over a century. Note: Pros often customize the racket they use. Racket specifications on endorsed consumer models may vary from the models used by pros for match-play.